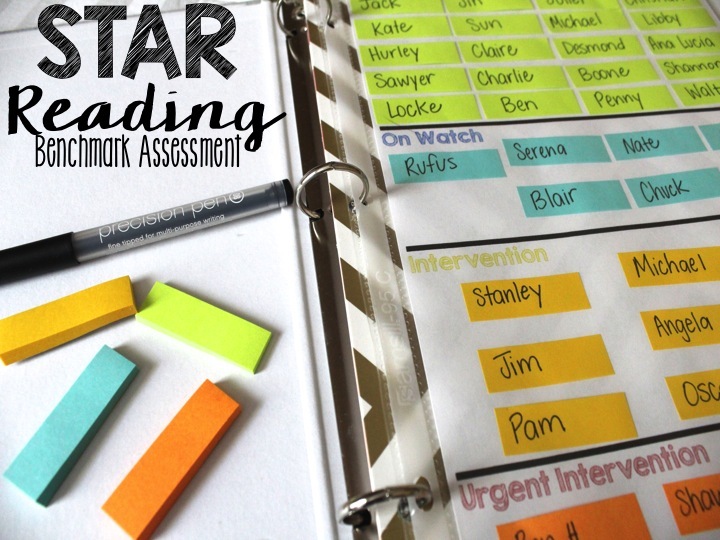 At my school, we use STAR Reading (part of Renaissance Learning) as our benchmark assessment. We take the assessment during the screening dates in the Fall, Winter, and Spring. I love this test because it allows me to see what areas the students are struggling in and which areas they've mastered. There's a ton I don't know about this program/assessment and it's my goal this year to better understand it. We took the fall assessment this past week so now I know where my students stand. Once all your students have taken the test, you can generate a report that shows which students have 'benchmarked', which are placed 'on watch', which scored under 'intervention' and which fall into 'urgent intervention'. We then use these scores to determine which students need to be placed into Tier II and Tier III for RTI. I need a visual and although the chart that the report generates is great, I hate to admit it, but I'll simply print it out and stick it in a folder. I need to actually do something with it to help me understand the needs of my students. I decided to create this chart to help me see what my students needs are a little bit better. Of course, I made fake names for the purpose of these pictures due to privacy, but this is how I use the chart. I color coded using Post It Flags and wrote each students' name on them. This way when we take the Winter Assessment, I can simply move the students into whatever category they scored and see if any progress has been made. Those precision pens are my new favorite pen. I bought a pack of 5 on a whim last night at TJ Maxx for $3.99 and I LOVE them! And aren't those target dividers gorgeous?! Gotta love the Dollar Spot! Don't forget to check out last week's visual plans. I'll be sharing next week's tomorrow! Great!!! I'll take a look later today and email you with my choice!!! Thanks for this!!! Aren't those the characters names from Lost!? This is a great idea! I'm an intervention specialist so I'm constantly looking for quick, easy ways to see where my students needs are. Is this grouping based on their overall benchmark, or can you sort by skill or standard? I love how you have organized your assessment data! I plan on doing hat for my scores this year! Thanks for the idea. I believe the shows are the Bachelorette, the Office, Gossip Girls, and Lost! You have been so helpful Leslie with your ideas and plans! I am getting my 5th Grade Reading/Language Arts classes underway now. We will have a full week next week! I would love your chart! Can you put it in TPT? Lost, The Office & The Bachelorette- Katelyn's season! Did you know that there's a report that actually shows you the specific standard each student is struggling with??? You can even group students and it will give you common areas they need to work on! I'd love a copy of the chart! Another great idea! I would you the chart. Can you put it in TPT? What a great way to visually see the needs in your room! Please share the sheet! I would love a copy of this, please! We use star in our district as wel. I love this idea. I would love to get a copy of this form if possible. Thanks for sharing! I would also love to have this chart! Thank you for sharing! I also would love a copy of your chart. Thank you! I love reading your blog! I would love to have a copy of the chart as we use STAR as well. I moved to 5th this year (after 23 years in 1st) and I am so thankful to have found your blog AND your TPT store! Thank you for sharing! I would love a copy of this resource! Thank you for sharing! I would love for you to share the chart!! We start back to school next week, and I hope to start blogging before... ummm... June! Thanks for being such a bloggy inspiration for me, Leslie Ann. Best wishes for a WONDERFUL school year!